The first version was a single card (didn't open like a book) with skinny TY and NO star. It had the name and info on the other side. The second version is exactly like the first, only now opens like a book with the info & name inside. The third version is just like the second, it opens like a book with the info & name inside, only the TY on the front is fatter and bigger. The fourth version is exactly the same as the third, only the that says "Beanie Original Baby" has been added on the front. The fifth version is exactly the same as the fourth, only the poem and date of birth is centered with a new font and it does not have the style number written inside the tag. The first version is black and white, no heart appears, and was produced in 1993. The second version is red and white, now with the heart, and has the year 1993 or 1995 printed on it. The name of the Beanie Baby does not appear, yet. The third version is still red and white, but the name now appears and has the year 1993, 1995 or 1996 printed on it. The picture shows the temporary tush tag. On the tush tag is a clear sticker with only a star printed on it. This sticker is placed over the "ty" heart so that the star appears in the upper left corner next to the "ty" heart. Remember that this is a temporary tag and that a new tush tag will replace it. This tush tag will make it easier to determine which Beanie Babies were produced in mid-1997. The 4th version heart tag remains the same. The Ty UK Ltd. address was changed. The red and white tush tag (with the name) has a added to the left of the Ty heart. The Canadian tush tag is a larger black and white tag. It is attached to all Beanie Babies that were produced exclusively for Canada. The information on this tag is written in English and French. This embroidered cloth Ty tush tag has been found attached to some Beanie Babies. The little that have this tag also have the 2nd version heart tag. 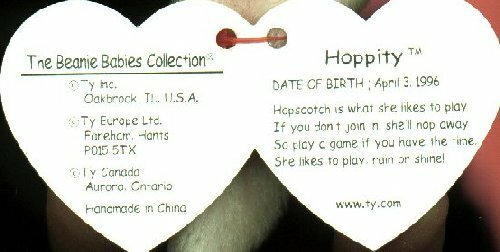 The embroidered tag is primarily used for other Ty products such as the Plush line (Attic Collectables & Pillow Pals).